This circuit will allow you to make your robot speak any word you wish, not just prerecorded messages. The heart of the circuit is the General Instruments SPO256-AL2. This IC uses 64 allophones to produce human speech. By stringing together different allophones, you can create any word you want. I'm not sure though if this works for other languages or not. Each allophone has an address that is passed to the SPO256-AL2 from the microcontroller making the SPO256-AL2 produce that allophone. The SPO256-AL2 uses 10 pins, so in this circuit, a 74HC164 is used to get down the number of pins needed to 4. Currently, I only have sample code for the Basic Stamp 1 & 2. The original circuit and Basic Stamp 1 code was developed by Jon Williams (jonwms@aol.com) in an article he wrote for the June 1998 (vol.19 No.6) issue of Nuts & Volts (back issues are $5). I converted Jon's code to work on the Basic Stamp 2. Click here - to download a recorded WAV file of the Speech Chip saying "Hello, I am the Basic Stamp Robot". Its only about 75k bytes so it shouldn't take more than a few seconds at most to download. There is also a small audio amplifier circuit included, but it is not needed if you have another source of amplification. I had the speech circuit connected to a small car audio amp and a home stereo amp and it worked fine with both of them. The SPO256-AL2 is out of production but as of this writing, you can still order them from BG Micro for less than $5. 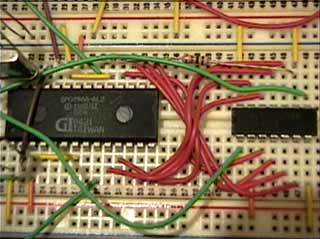 Speech circuit built on a breadboard. The 4 long green wires are the data lines that connect to the Basic Stamp II.. 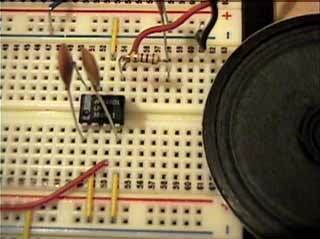 Audio amplifier built on a breadboard. I used an 8 ohm speaker. Not the best amplifier, but it will work.